Beware, I have a lot to show you. 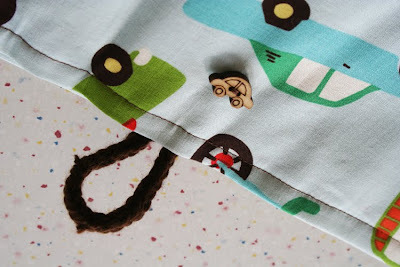 :) Remember the adorable car fabric from last week? Finn now has a new crayon/pencil/pad holder. 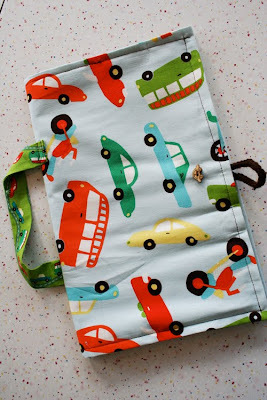 Well, he doesn't actually have it yet since I'm saving it for our trip, but I know he's going to love it since he saw the fabric on my blog the other day and got very excited about that "car and bus and van cloth". Here's the holder fully stocked with colored pencils, crayons and a pad of paper. He even has an extra pocket for tape or scissors, or a box of soy crayons right now. I even managed to include one of his beloved car buttons and a knitted i-cord loop closure so it doesn't flop open unexpectedly. 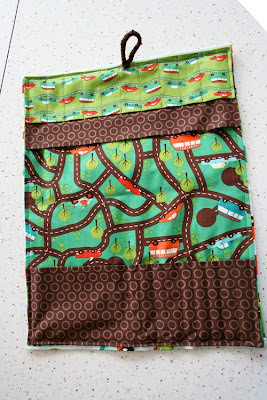 I'm really excited by how it turned out and how many kinds of car fabric I was able to include. Now...on to the knitting! I've been working furiously on Easter basket goodies, which are likely to not even see the inside of the Easter baskets since we're spending the week leading up to Easter in London. Either way, I wanted the kids to have some sweet, spring-y treats. 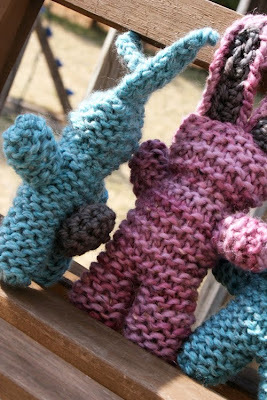 First up, these adorably soft bunnies, found in the latest issue of Rhythm of the Home. I started out just using the soft blue yarn, but then decided to make Elizabeth's in a heathered pink. I think it was a good choice; I love how sweet they look together. I'm also three-quarters of the way done with a set of Easter peeps, also for the kids to take on our trip. I first saw this pattern last year when a friend made some. 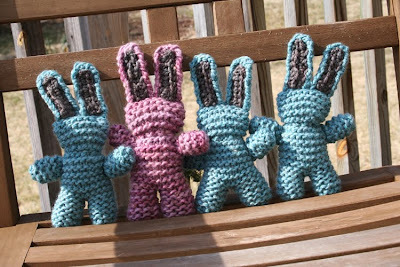 I so desperately wanted to be able to knit them, but I was still on washcloths and scarves at that point. 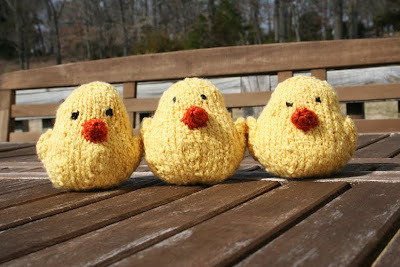 I wasn't about to miss out on knitting some peeps this year now that I have a bit more experience! The yarn is pima cotton Crayon Boucle by Knit Picks. An inexpensive craft at $2 for 4 peeps! 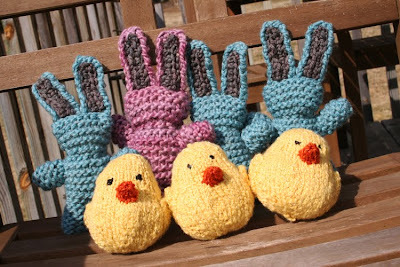 I also stuffed the peeps and bunnies with bamboo so they are washable. I am dying over everything posted here!!! LOVE those little peeps!!!! 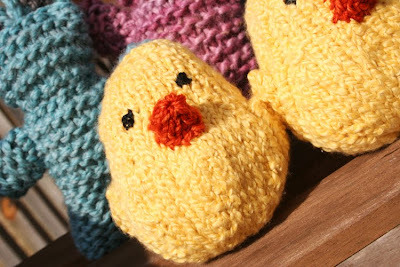 What great gifts for the easter basket Joy! Oh, Joy. Those are all so great. I love them!!!! Easter really is coming! I love those little peeps!!! Eeeeek! Joy! How do you do it? How do you make such beautiful things working full time and wrangling 4 kids? You may as well open an etsy shop while you're at it. 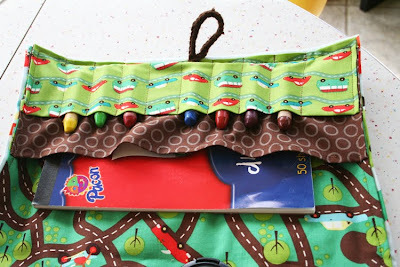 Finn is going to love that car art holder and the knitted critters are just as gorgeous! Oh, I love it all! 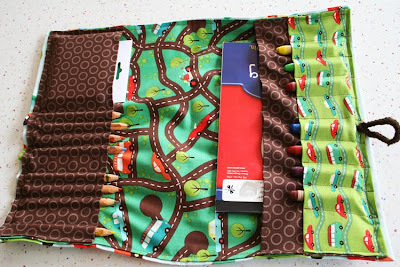 oh my goodness, that crayon holder is adorable! Everything looks great. The bunnies are cute and I like the little chicks. Oh my...you are amazing! I'm guessing your kids will be very excited to see these little treats you made for them. I made myself one for my colored pencils a few years ago, but I'd love one for Maddie for a take-along! That one is darling!!! very adorable. you are a busy mama! 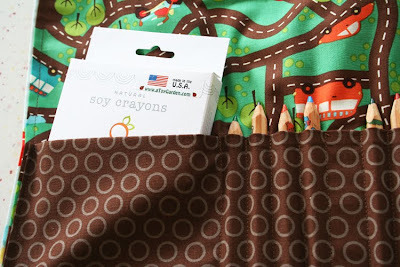 We've been using those soy crayons & I love how they draw! You did such an amazing job on everything on here. I love the bunnies especially.